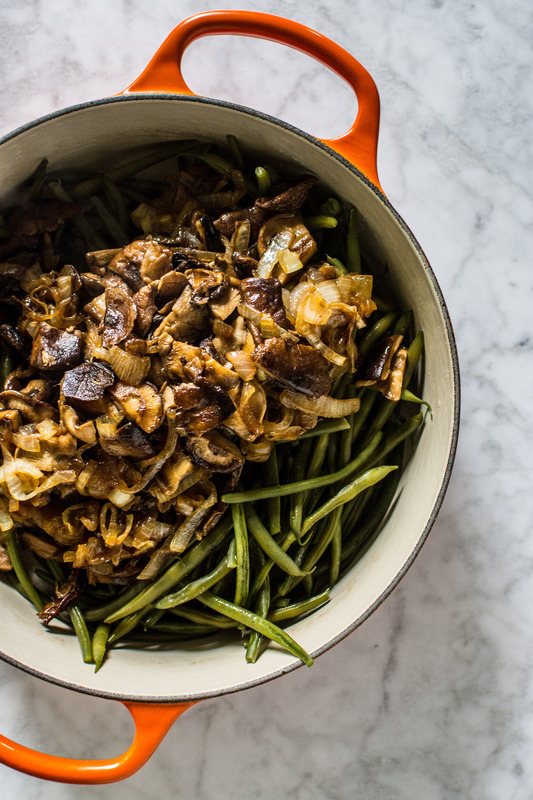 Weeknight or weekend, it was the side dish we all looked forward to: green beans and mushrooms. No, not the casserole. There were never fried onions to top and it was never baked. 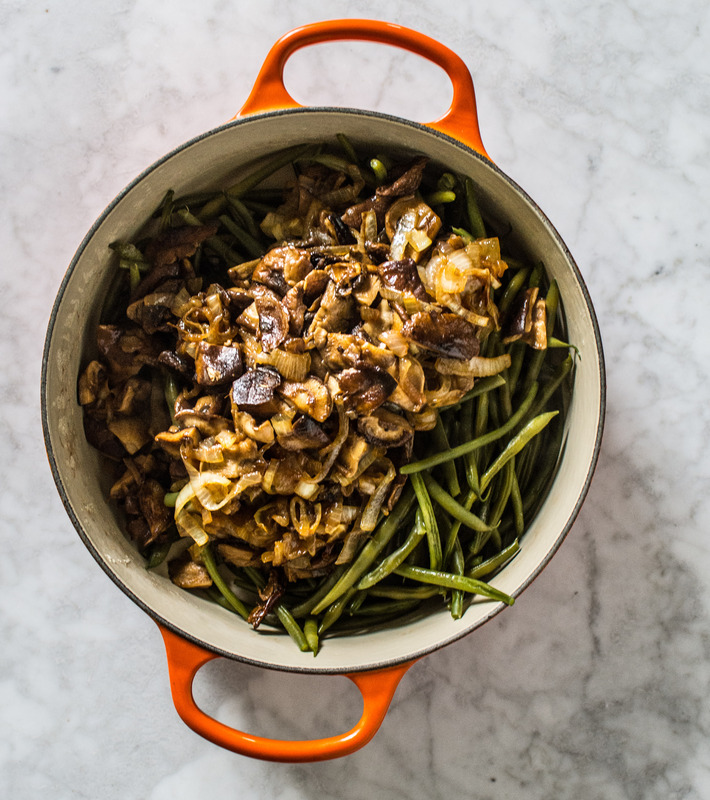 Canned French green beans and cream of mushroom soup were combined into a saucepan and cooked on the stovetop. Five minutes later it was ready to eat. It was my mom’s go-to side that made everyone happy, which made her happy. We probably ate this side dish a few times a week and no one ever complained. Maybe that’s why she made it all the time? The soft green beans with salty mushroom sauce still strike a chord in my food cravings and memories. There have been multiple times I have tried to recreate my mom’s “green beans and mushroom soup” without the canned condensed soup or the canned green beans. It’s taken some trials (and errors) to finally achieve what I find to be an appropriate match to this time and money saving side dish. 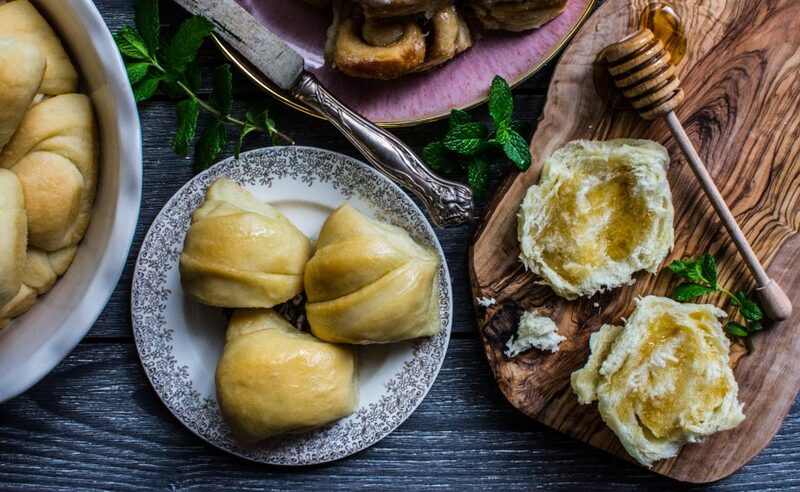 Achieving a recipe replica while omitting the only two ingredients was tricky. While the canned green beans and canned condensed soup were perfect ingredients for her kitchen, they do not reflect mine. 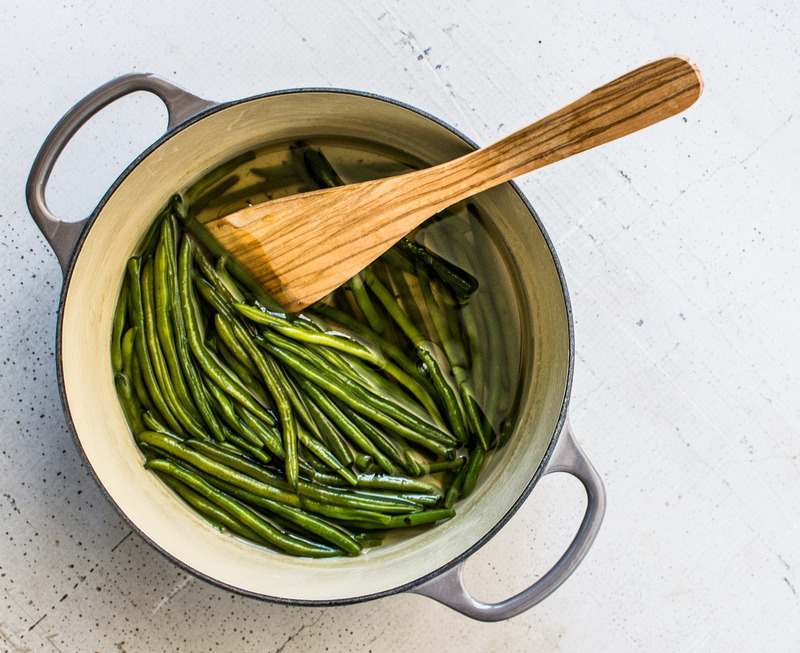 It starts with duplicating the canned French green beans; they need to be cooked to tender and they need to be thin. Scanning the produce aisle at Market Street I zeroed in on exactly what I needed: haricot verts. Haricot vert is French for green bean AND in the food world it refers to the long thin green bean. There were a handful of green bean options at Market Street but these particular haricots were perfect for the recipe not just because of their size but also because of how they are packaged: cleaned and trimmed. 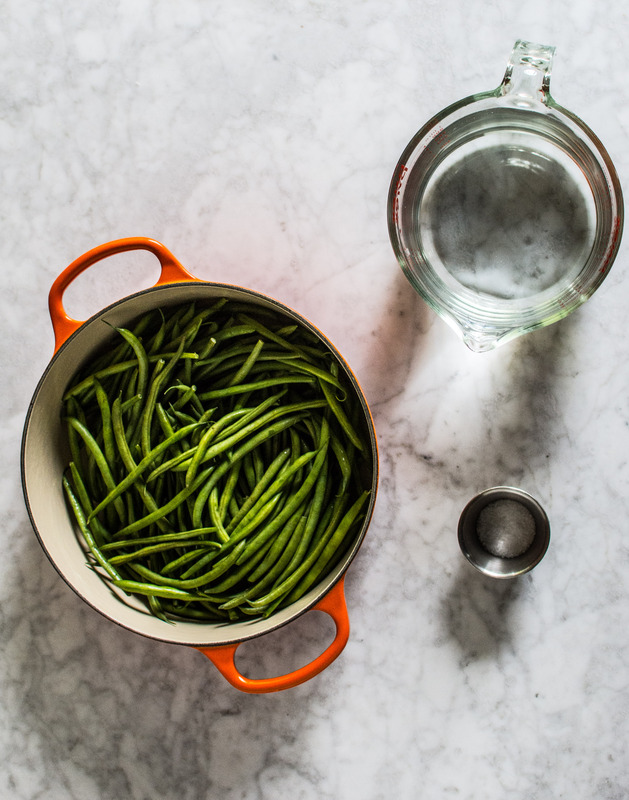 12 ounces of haricot verts were perfectly packaged ready to be placed in a pan, covered with water and topped with salt. 30 minutes of slow simmering and the haricots become tender AND possess a rich flavor only braised green beans can create (think grandma’s green beans folks). There was nothing magical about this process of braising the beans. Three ingredients and 30 minutes was all it took to accomplish half of the recipe. However, it was recreating the salty, flavorful condensed mushroom soup that has been the hold-up in replicating my mom’s recipe. I needed the mushroom flavor to be extremely present. I also wanted this side to be a teensy bit healthier (i.e. no cream). 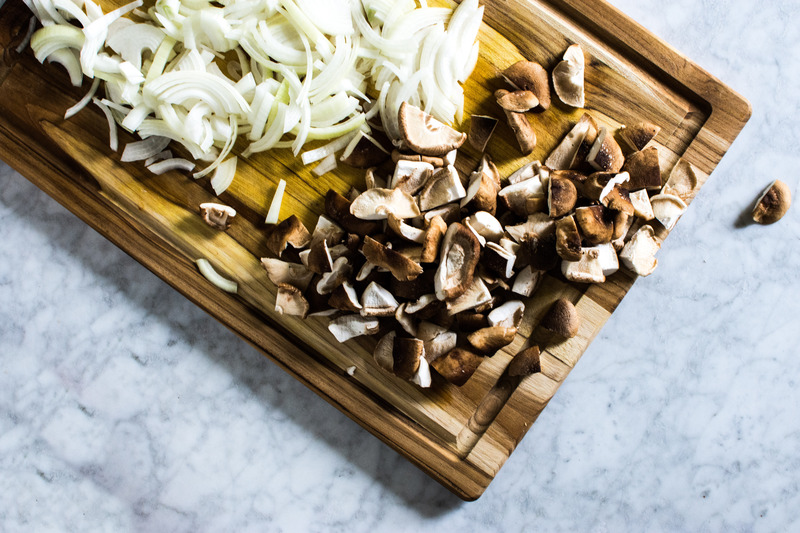 Remove the stems from the porcini and shitake mushrooms. Place the stems and onion ends into a saucepan. Pour 2 cups of water into the pan. Simmer for 30-40 minutes, or until there is about 1 cup liquid remaining. Place the porcini mushrooms in a small bowl. In the microwave heat 1 cup of water. 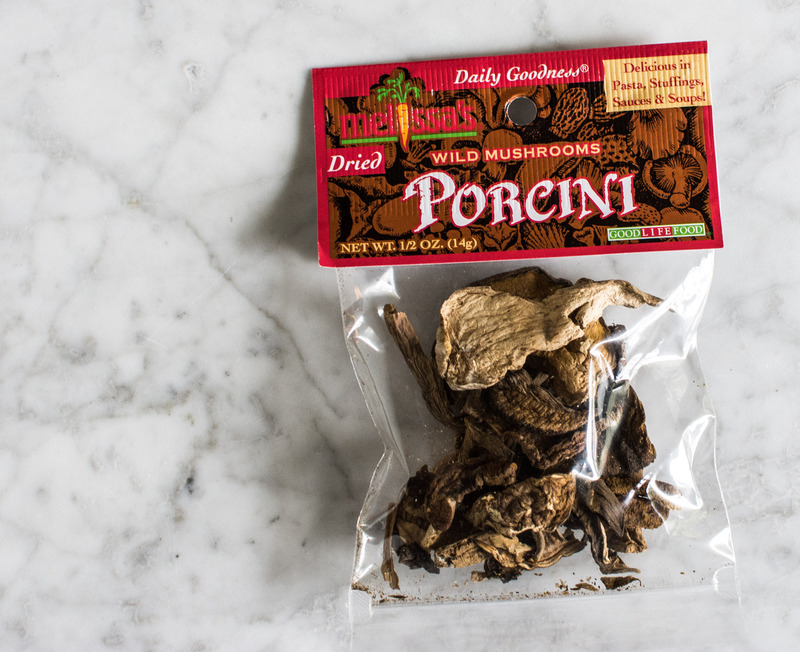 Once it’s boiling, pour it over the dried porcini. Let it sit for 10 minutes. 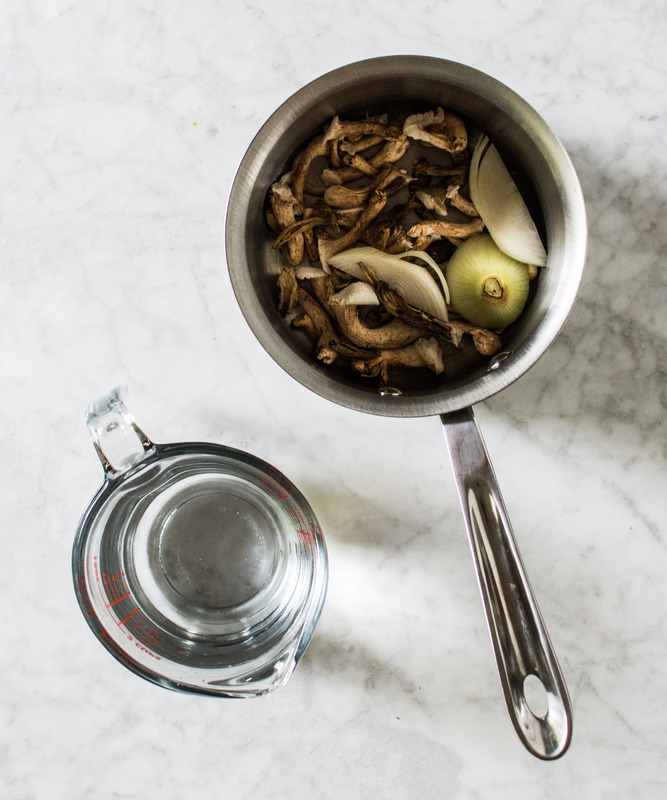 Strain the porcini water into the simmering mushroom stock. Set the rehydrated porcini onto a cutting board. Rinse the strainer to use later. Meanwhile, in a large flat bottomed skillet heat the olive oil over medium-low heat. Add the onions and salt. Cook for 30-35 minutes until golden. Stir occasionally. Once the onions are done cooking, place them into a separate bowl. Place the skillet back onto the stovetop. In the skillet, melt the butter over medium heat. Add the mushrooms to the pan and sauté until softened, about 5-7 minutes. Add 2 ladlefuls of mushroom stock to the sautéing mushrooms. Allow the mushrooms to absorb this mushroom stock. Add the cooked onions into the pan with the mushrooms. Stir well to combine. Add another ladleful or two of mushroom stock. Cook for 5 minutes, or until most of the liquid has been reduced, stir frequently. Strain the mushroom stock into the skillet. Add the braised haricot verts and the haricot verts braising liquid. Warm through for 10 minutes. Serve warm. Author note: Sometimes I add a teaspoon of tomato paste to the braising liquid to add even more depth of flavor. If you cannot find haricots, fresh green beans also work. If doubling the recipe, do not double the salt amount, instead, salt to taste. Place all ingredients into a medium sized pan. Cover slightly with a lid. Bring the water to a boil and then reduce to a hearty simmer. Braise for 30 minutes or until the haricots are tender. Disclosure: This is a sponsored post on behalf of Market Street. All opinions are my own and I appreciate your support of the brands and companies I love. This entry was tagged a pleasant little kitchen green beans and mushroom, a pleasant little kitchen haricot recipe, dallas food blog, dallas food blogger, food memory, green beans and mushroms, green beans and mushrooms throwback, haricot verts and mushrooms, texas food blog, texas food blogger. Bookmark the permalink.